If you’re a fan of clean and super bright interiors with a minimalist setting and a charming outlook then you’re the perfect candidate for Scandinavian design. The Scandinavian style results in a super neat, clean and inspiring appearance due to the use of a white color scheme often enhanced with high contrast tones, a quirky decorative palette, lots of natural wood materials and ideally big windows that let in tons of natural light. 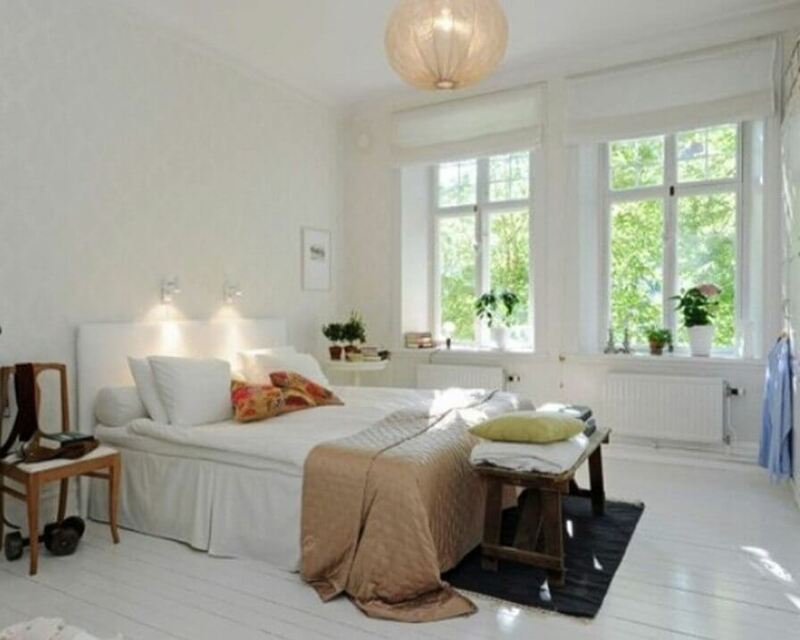 Scandinavian design is perfect for the bedroom as it creates a profound and inspiring energy. 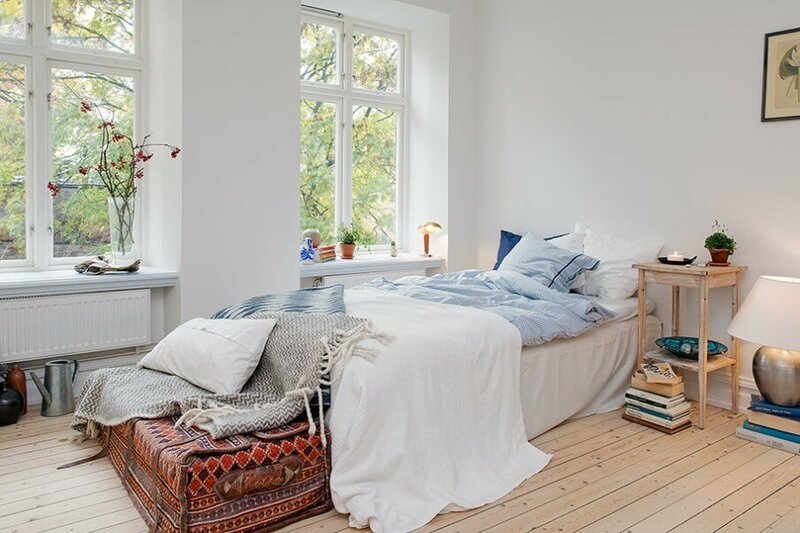 Words can’t describe what a picture can though so we’ve prepared this inspiring showcase of amazing Scandinavian bedroom interior design ideas. 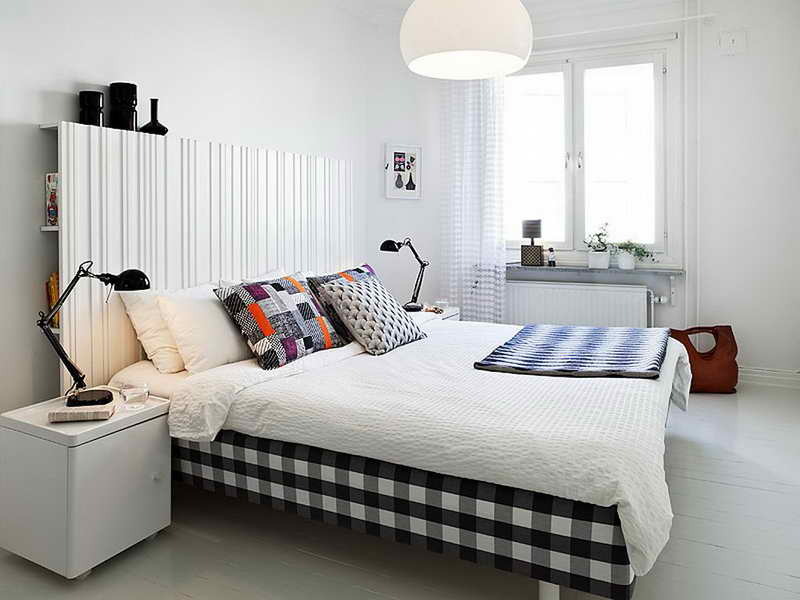 This Scandinavian bedroom looks so clean and crisp due to the snowy white color scheme smartly combined with high contrast tones and bold geometric patterns like the plaid white and black bed. We absolutely love the sleek and cozy feel of this gorgeous bedroom. The black lamps are a nice high-contrast touch as well. The exposed concrete beams certainly create a bold statement in this beautiful Scandinavian bedroom. We love the simplicity and how the dark wood floor strikes with the modern and contemporary but still cozy natural feel of the room. The white shag area rug is a fantastic touch as it soothes down the harsh feel of the room making it soft and comfortable. This room is super chic and inspiring. 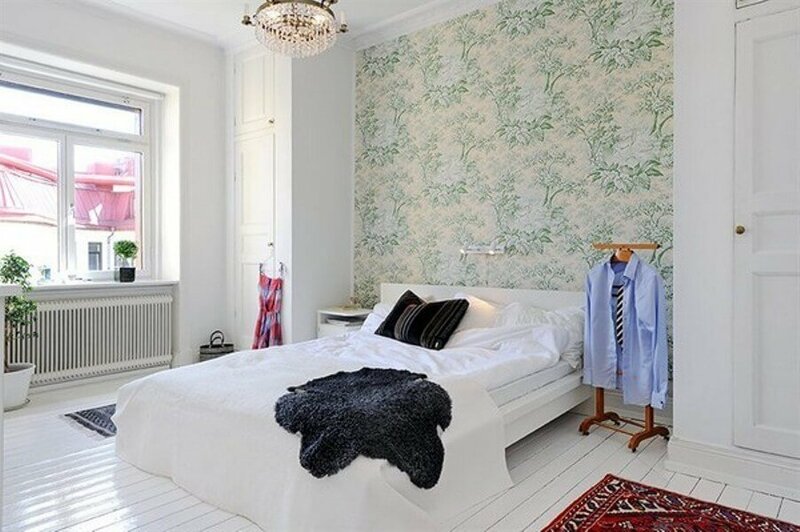 We love how clean, utterly bright and perfectly decorated this bedroom is. It’s perfectly decorated with refreshing floral wallpaper, a classy chandelier and the ethnic looking area rug. We love everything about it! 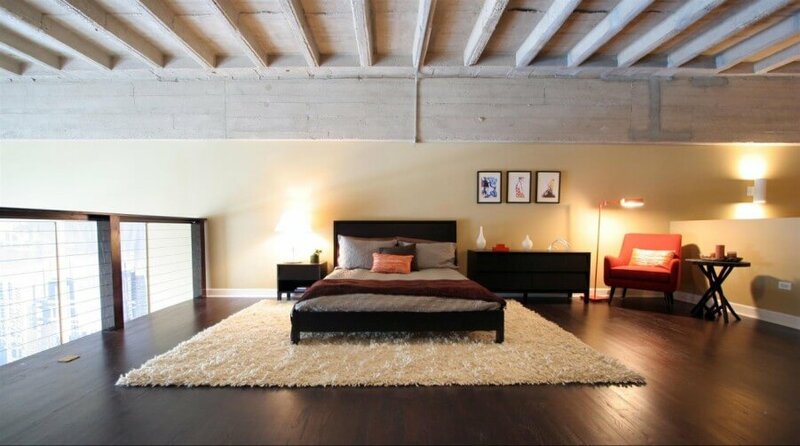 Here is an extremely clean and sleek bedroom. The white color scheme and the two tall windows that bring in natural light make everything look bright and happy. The overall minimalist interior is absolutely bursting with neat energy and we love it! The painted natural stone wall works as an extremely amazing natural backdrop for this overall cool and cheery bedroom. The minimalist setting helps the room to breath while the interesting structure of the wall works as a bold decorate element. Everything goes amazingly well with the natural wood floor too. This Scandinavian bedroom is decorated with funky and cool details giving the room an overall contemporary and bold appearance. The typography artwork stands out on the wall giving the room a little something extra unique. The white walls, bedding and shelves pair perfectly with the dark floor and the rug adds a much needed touch of color. Here’s another amazingly sleek and natural bedroom. The contemporary gray bed with its interesting design makes a very cool focal point especially combined with the modern artwork above. The natural wood floor and shelves work amazingly with the white color scheme and that open closet is just perfect. This bedroom is sheer serenity. 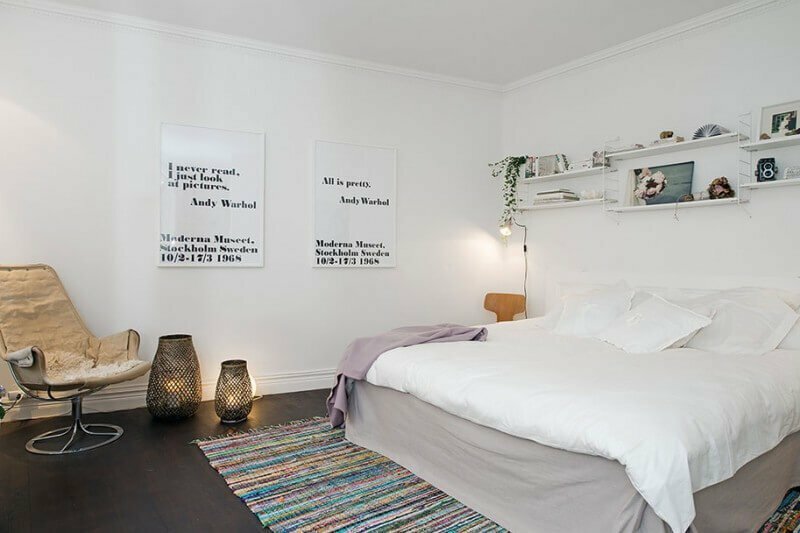 The soft and beautiful appearance of this Scandinavian bedroom is due to the combination of a white and creamy color scheme matched with natural wood and super classy touches like that chandelier, lamp and candlesticks. This bedroom is super refreshing and cool. 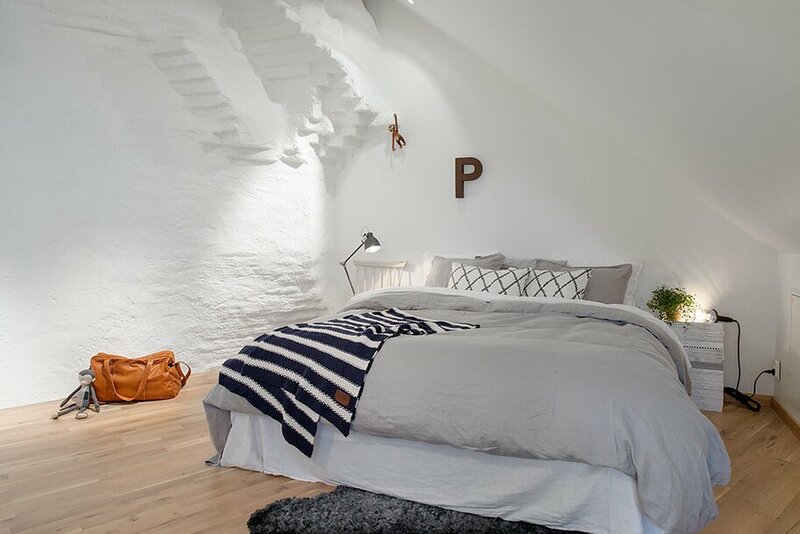 The effortlessly cool and chic appearance of this Scandinavian bedroom is just amazing! The room is full of natural sunlight, natural materials and pops of color. We’d certainly love to relax in this room.